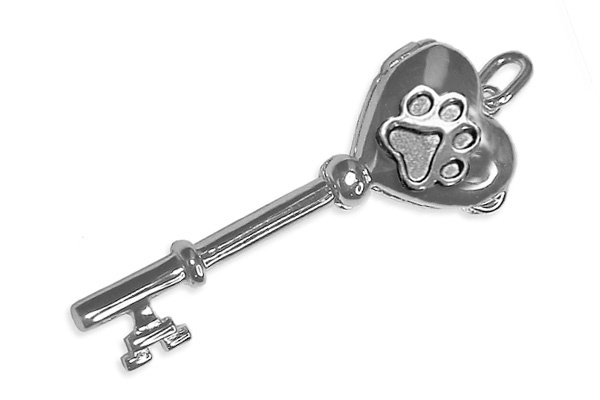 A large sterling Key Locket w/Puppy Paw® that can hold photos,cremains or a lock of hair of your beloved pet! This locket is not engraveable. Comes with an/18", sterling silver necklace. This Puppy Paw® can even be made into a Mother's Paw® that can hold 7 birthstone crystals! AND we'll add a photo of your pet for FREE. Sterling silver Key Locket comes w/an 18", sterling silver necklace. size is approx 21mm 5/8" x 7/8" weight approx 1.50 grams image is enlarged to show detail please allow 1 week for delivery. A small lock of hair can be sent in the mail. By mail send your image at a high 300dpi to info@puppypaws.com with your name and invoice number. By mail, send photos to Puppy Paws Inc, 6763 Stafford Dr, Mayfield Heights OH 44124. Original photos will be returned with your locket. To add cremains please use the same process as above.